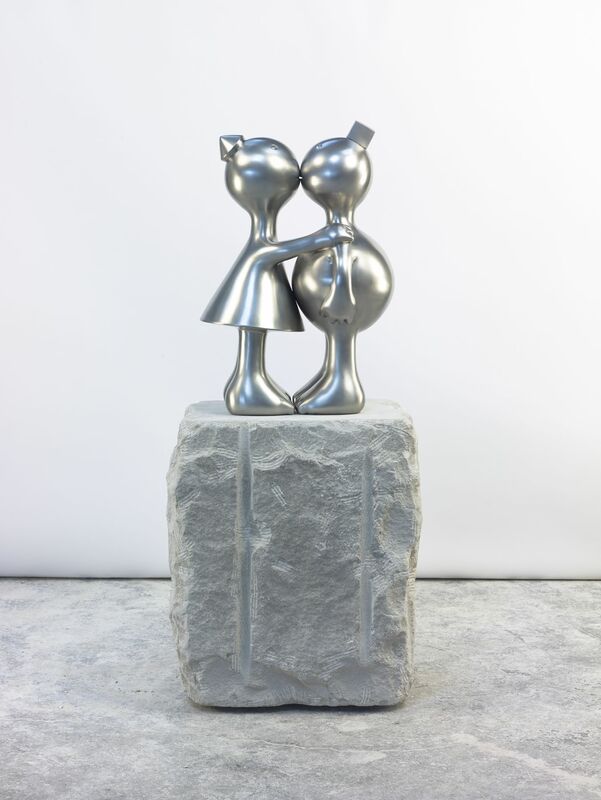 NEW YORK, NEW YORK: The Directors of Marlborough Gallery are pleased to announce an exhibition of recent works by Tom Otterness entitled Creation Myth which will open on Wednesday, October 22nd with an opening reception from 6-8 PM and will continue through November 25th of 2014. 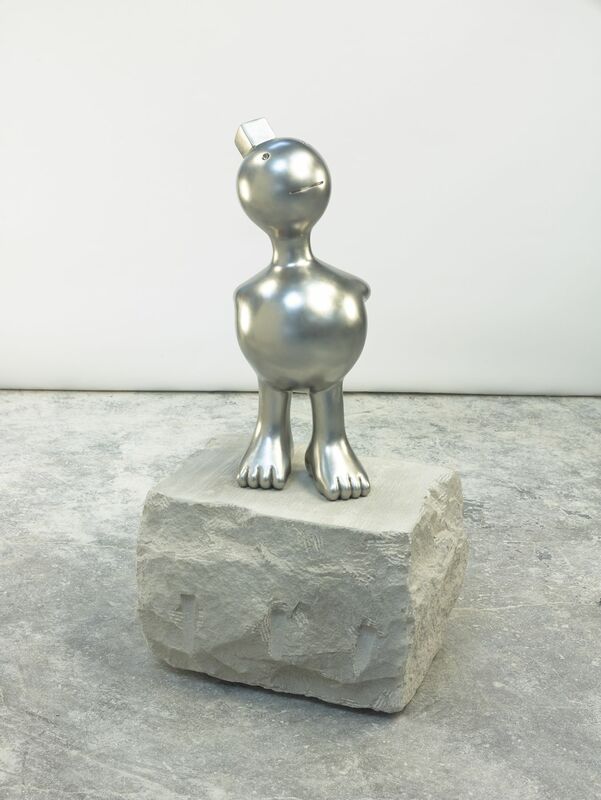 Creation Myth will consist of over twenty sculptures in stainless-steel & limestone, bronze, and marble. 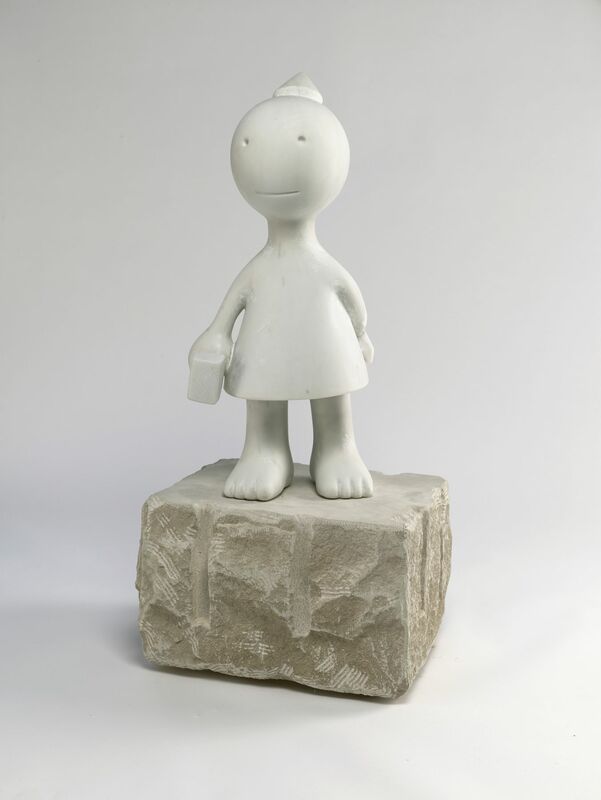 The works range in scale from small to monumental. 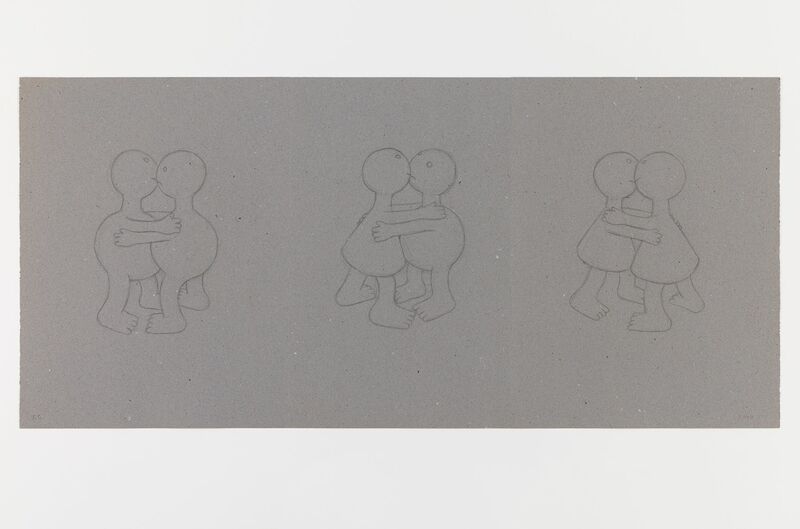 The exhibition is comprised of a collection of narrative works that innocuously allude to larger concepts. 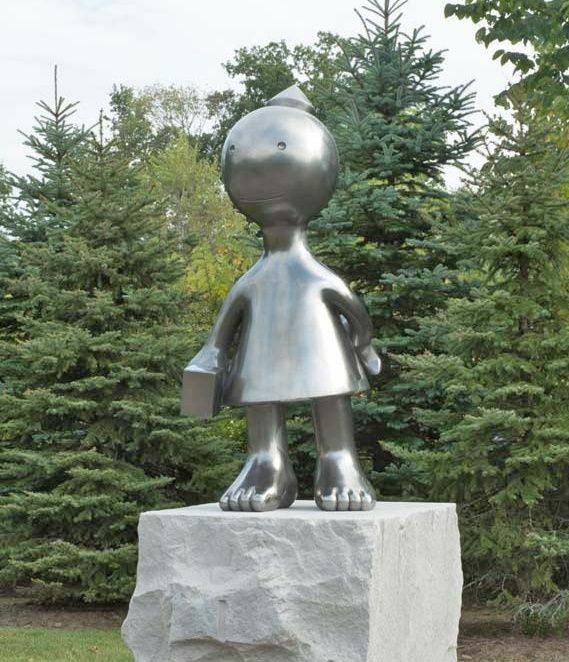 The sculptures grew from a body of monumental public artwork that Otterness realized for the Memorial Art Gallery’s Centennial Sculpture Park at the University of Rochester. An homage Susan B. Anthony, the anti-slavery advocate and pioneering suffragette who made her home in the city of Rochester from 1845 until her death in 1906, Creation Myth is a reinterpretation of the classical trope of male creativity. 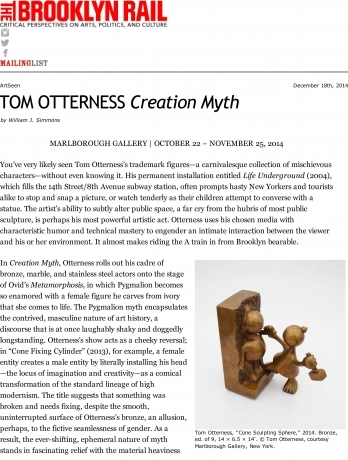 In painting and sculpture, the default position for Pygmalion is practically the definition of erotica: a naked female figure... For his “Creation Myth,” Otterness came up with a completely different solution, and a rather more complicated one. For one thing, the eroctic has been eliminated; it is a distraction, after all, and not very useful in public sculpture. 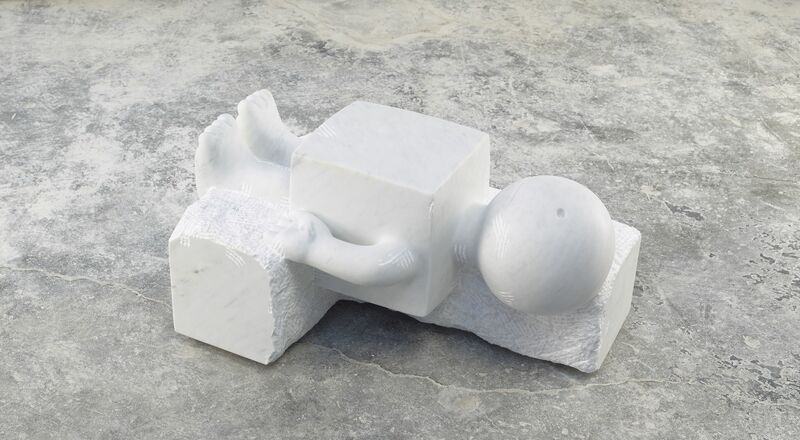 The work instead articulates a sociological proposition, and manages to represent a complete narrative in a way that is not usually seen in figurative sculpture today. In an art world that is generally too A.D.D. 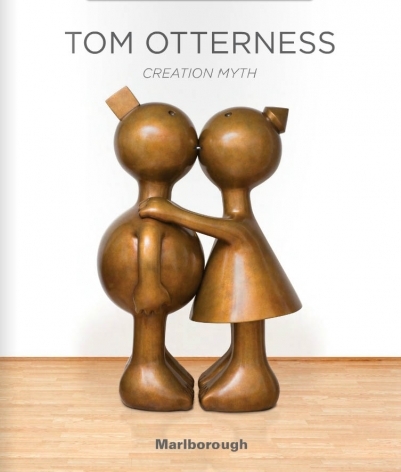 for anything that takes more than a glance, Otterness manages to tell an entire fable. 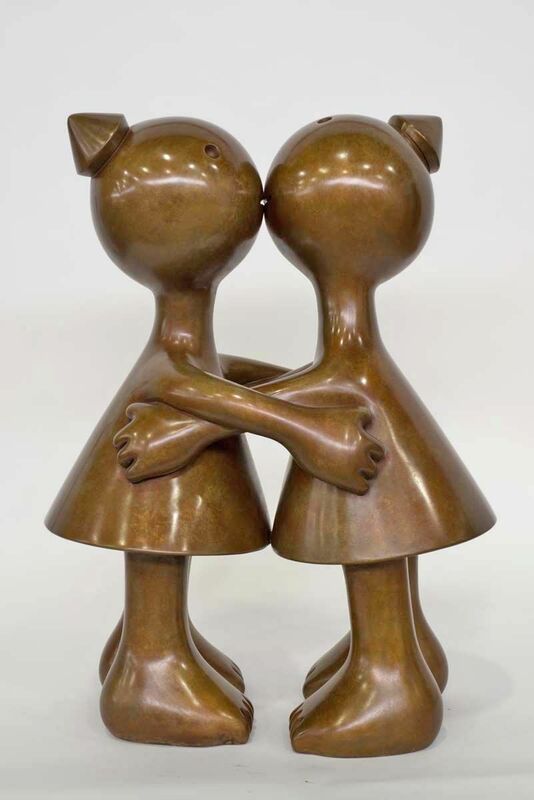 Marlborough Gallery has represented the work of Tom Otterness for nearly 20 years. 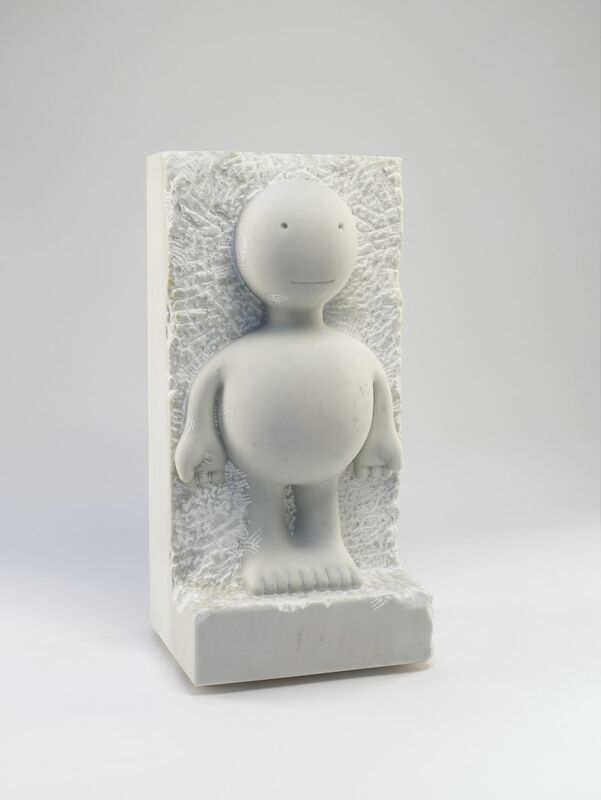 His sculptures are in collections of numerous museums including The Museum of Modern Art, New York; The Whitney Museum of American Art, New York; Israel Musuem, Jerusalem; The Miyagi Museum of Art, Sendai; Beelden aan Zee Museum, The Hague; the IVAM Centro Julio Gonzalez, Valencia; The Solomon R. Guggenheim Museum, New York. Comissioned public art projects include: the United States courthouse in Minneapolis and Sacramento, an extensive installation at the Governor Nelson A. Rockefeller Park in Battery Park City; Life Underground in multiple areas of the MTA 14th street A-C-E-L subway station in New York City; The Marriage of Real Estate and Money at New York City’s Roosevelt Island; Time and Money in Times Square; Creation Myth at the Memorial Art Gallery’s Centennial Sculpture Park in the University of Rochester in Rochester, New York; and Playground, a public commission for the Hamad International Airport in Doha, Qatar. 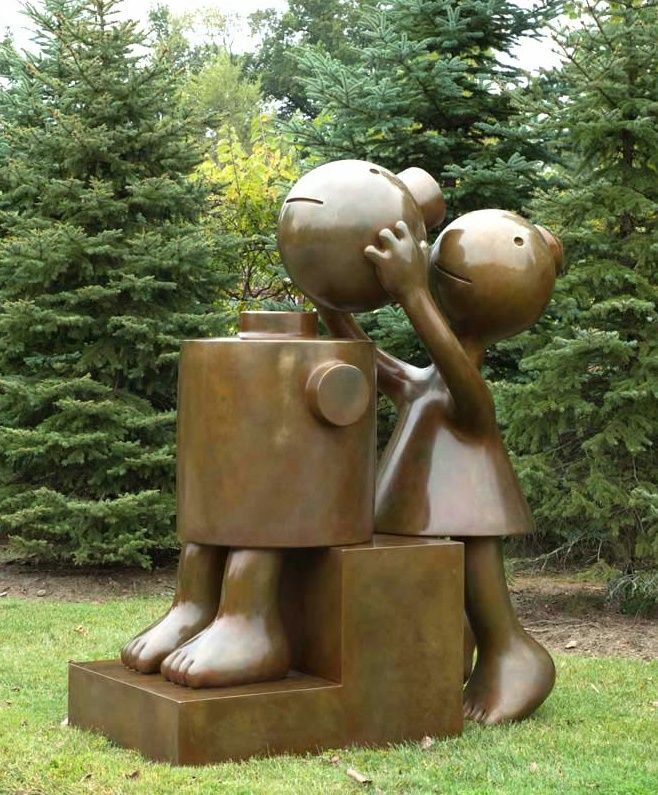 In 2004 Otterness staged a series of monumental outdoor shows, beginning with the highly acclaimed Tom Otterness on Broadway, an exhibition of twenty-five bronze sculptures that spanned five miles of the famous throughfare in New York. 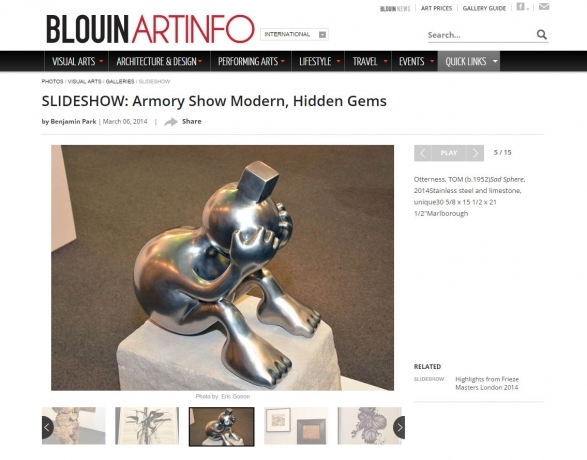 This inspired similar exhibitions in Indianapolis, Beverly Hills, and Grand Rapids. 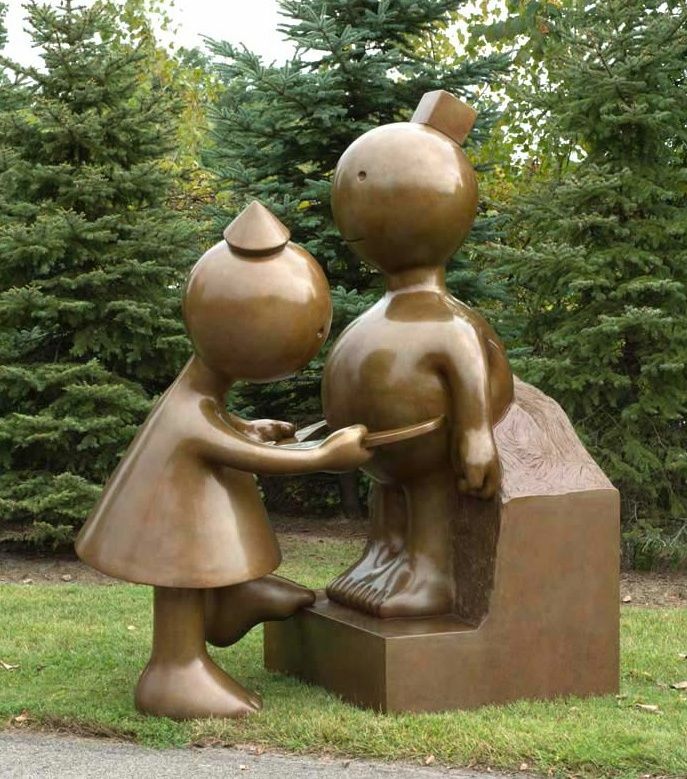 Otterness was also the first contemporary artist invited to create a helium balloon, Humpty Dumpty, for the Macy’s Thanksgiving Day Parade, seen by millions of television viewers worldwide. 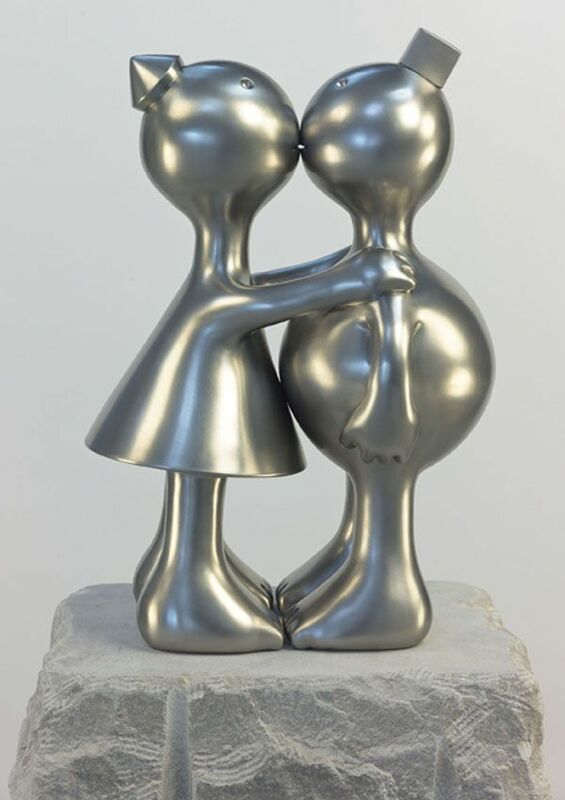 Originally from Wichita, Kansas, Otterness has been a resident of New York City since the 1970s and works in Brooklyn. A fully illustrated catalogue with an essay by Walter Robinson will be available at the time of the exhibition.